Decisions, decisions, decisions. There are so many things to consider when you’re planning to move cross country – it can be mind-boggling. For instance, should you hire a moving company? Or, should you rent a large moving truck, and handle the entire move on your own? If you feel uncertain, here are a few tips to help make your decision. Is hiring a professional moving company truly worth it? Moving is both emotionally and physically stressful, especially a cross country move. Hiring a professional moving company, like Lexel Moving, will streamline your moving process, save you time, and money. Most of all, hiring someone will help make your cross-country move more enjoyable and memorable. What to look for when hiring cross country movers. Make sure the company you’re hiring is licensed, ensured and bonded. After all, your possessions will be under their care during the entire trip. Before choosing a moving company, ask what will be included in their moving services (i.e. fuel, mileage, tolls, loading, unloading, transportation, furniture disassembly and reassembly, etc.). Try these moving services to help make your move easier. Launch a profitable moving sale. Your junk could be someone else’s treasure. Instead of throwing out your unwanted items, have a garage sale or sell your items on Craigslist, Facebook Marketplace or eBay. You’ll be surprised how much money you could possibly earn by selling your unwanted items, especially if you plan to sell quality items. Plus, you will have a lot less to pack for your cross-country journey. Quick Tip: Make sure your sign is highly visible, use big bold ‘GARAGE SALE‘ lettering (don’t use crayon, pencil or an ink pen). Don’t forget to have enough cash on hand to break change for your customers. If you’re selling online, make sure you take high-quality photos of the items you plan to sell. What mode of transportation are you planning to take? There are four common ways to travel: by plane, train, bus or you can drive. Hiring a moving company while you travel by plane is obviously the most efficient choice. Taking a train is convenient, but it could take 3 days or longer to get to your destination. Bus travel can be very uncomfortable, and you run the risk of experiencing major delays if the bus breaks down. Driving is a good option because you have more leg room. However, you could run into unexpected problems. Are you prepared for a break down? There have been instances where people have driven cross country and broke down on a Friday, and had to wait until the following Monday because the local mechanic shop was closed during the weekend. Make sure you set aside extra funds to cover for breakdowns, overnight hotel stays, a car rental and food. Always be prepared for the inevitable! Quick Tip: Do not allow your gas level to go too much below half a tank. There is nothing more frightening than driving on empty when the next gas stop is more than 30 miles away. Moving on your own in a rental moving truck? Many people choose the option of DIY moving because they feel it provides more freedom. Driving cross country is the only way to truly experience the beauty of America. Other forms of transportation aren’t quite the same. If you’ve moved long distances before, in a rental moving truck, more power to you. However, if you haven’t driven further than 1000 miles, at a time, you might want to think twice before taking the plunge. There is a truckload of things to consider, no pun intended. Can you find friends and family who will help you load up your belongings (safely) onto your rental moving truck? Can they load your valuables without dropping or scratching them? If something gets lost or damaged, will they be willing to replace or pay you for the damage? Another thing to consider is if something falls, and breaks during your travels, due to not being positioned properly within the truck. The risk of something getting damaged or broken is less likely to happen when a trained professional is in charge. Plus, movers have experience in transporting goods long distances safely. DIY moving can be extremely tiring. You also must consider your level of energy. Be honest, after traveling hundreds of miles, no one feels like unpacking a truck full of boxes and furniture. Plus, you must return your truck rental on time. If you’re planning to drive cross country, you’ll probably need 2-3 days to recuperate from the long travel. Are you prepared to unload your truck on your own immediately after a long travel? Even if you recruit family and friends to help, it is still very exhausting. Unloading your own truck is like a full-time job! Things to remember and avoid when moving cross country. 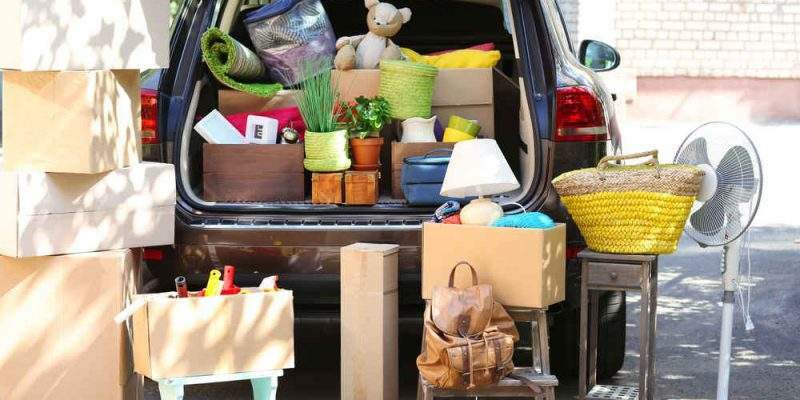 Do not wait until the last minute to plan a move, if you can. Unless you’re a pro at moving long distances, save yourself the hassle and hire someone to handle your move for you. Never skimp on packing. Make sure you purchase plenty of boxes, in various sizes. Allow yourself PLENTY of time to travel. For example, if it takes an average of 28 hours of travel time to your destination, plan for a longer travel time – like 38 hours. Always plan ahead for unexpected delays (inclement weather, extra rest time, breakdowns, etc.). Make sure you budget enough money for emergencies like breakdowns or unexpected hospital stays. When it comes to DIY moving, always prepare for the worst. If you’re still debating whether to hire a professional or attempt to move on your own, think about the benefits of both options. What will give you more peace of mind and less stress? The most important thing of all is choosing an option that will transport your belongings to your destination safely, and make our moving experience more enjoyable.